One of my lasts crochet works – crochet fingerless gloves. They are unique and original SexyCrochet design. 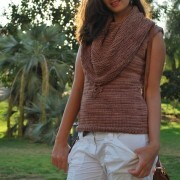 Romantic and very feminine warm accessories made with good quality – 100% wool yarn in so beautiful brown and red colors. This is one of those things that you will need to make fall and winter bearable and cozy. This very warm and classy mittens are very soft and not irritant to skin. Buy crochet fingerless gloves on Etsy.